Did you know that self-acceptance is one of the well-being habits that we practice the least, but that it’s the most impactful habit of all? 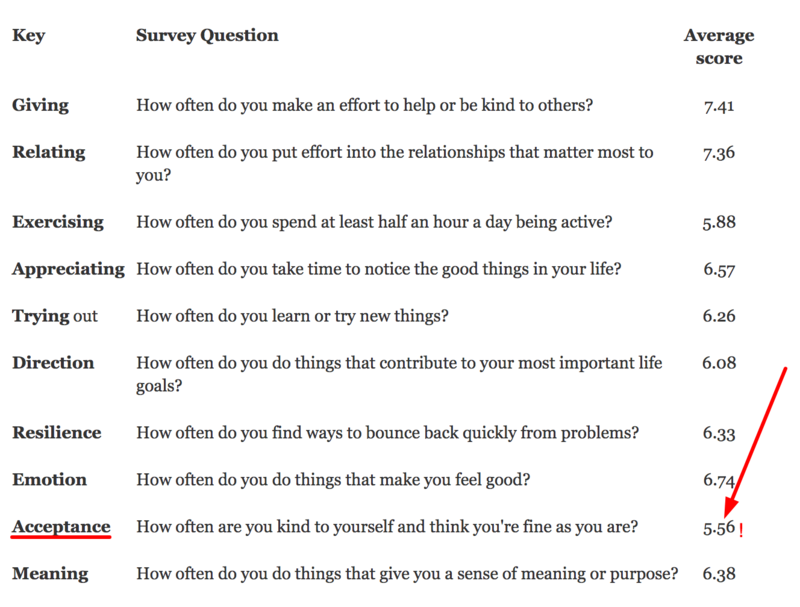 A UK survey of 5,000 participants found that out of 10 key “Happy Habits”, participants engaged in self-acceptance the least; see the table below (Action for Happiness, 2014). And lest we assume that people neglect to practice self-acceptance because they already enjoy a high level of self-acceptance, research has found this hypothesis to be unproven. A recent study of adults using the Unconditional Self-Acceptance Questionnaire indicated that the median self-acceptance for adults is low and that a high proportion of people—both men and women—report low or very low self-acceptance (Vasile, 2013). Further, we know that mindfulness is related to tons of positive outcomes, and it seems that enhanced self-acceptance is the mechanism through which many of these positive outcomes occur. Self-acceptance is the strongest link between mindfulness and depressive symptoms, indicating that it is through improving self-acceptance that depression is kept at bay (Jimenez, Niles, & Park, 2010). Self-acceptance is strongly correlated with both mindfulness and subjective well-being (SWB), and research suggests it is a “critical factor” for SWB (Xu, Oei, Liu, Wang, & Ding, 2014). It is also a mediating factor between mindfulness and healthy self-image, a relationship that is particularly important for those with eating disorders (Astani, 2016). Self-acceptance is also the mediator between mindfulness and perceived stress (Rodriguez, Xu, Wang, & Liu, 2015). Not only does self-acceptance influence our feelings and emotions, it has an impact on the brain itself. Poor self-acceptance is intimately tied with poor self-esteem, and feeling bad about yourself is associated with structural changes in the brain; those with low self-acceptance/self-esteem have less grey matter in the anterior cingulate cortex, the right lateral prefrontal cortex, the right hippocampus, and the left hypothalamus (Agroskin, Klackl, & Jonas, 2014). These areas of the brain are involved in emotion and stress regulation, so a lack of grey matter in these areas can translate to more stress, more anxiety, less control over emotions, and a lower sense of well-being (Pillay, 2016). Self-acceptance allows us to forgive ourselves (Dixon, Earl, Lutz-Zois, Goodnight, & Peatee, 2014), forgive others (Porada, Sammut, & Milburn, 2018), and have a high tolerance of frustration and discomfort (Jibeen, 2017). We explore this further in The Science of Self-Acceptance Masterclass©. Agroskin, D., Klackl, J., & Jonas, E. (2014). The self-liking brain: a VBM study on the structural substrate of self-esteem. PloS one, 9(1), e86430. Astani, A. (2016). Mindfulness and unconditional self-acceptance as protective factors against thin ideal internalization. Annals of the AI. I. Cuza University, Psychology Series, 25, 37-46. Dixon, L. J., Earl, K. A., Lutz-Zois, C. J., Goodnight, J. A., & Peatee, J. J. (2014). Explaining the link between perfectionism and self-forgiveness: The mediating roles of unconditional self-acceptance and rumination. Individual Differences Research, 12, 101-111. What is Self-Esteem? A Psychologist Explains. There is no reference for the paper Agroskin, Klackl, & Jonas, 2014 – please can you advise? Hi Charlotte, thanks for bringing this to our attention, it has been added to the reference list! It is agood article .it helps me as a teacher and a mother .And first of all it helps me personally especially always Iam looking to improve my self confidence and self acceptance. This is a well constructed and informative article. The contents will be shared with professionals in a course for youth engagement and leadership development (YELD) facilitators. 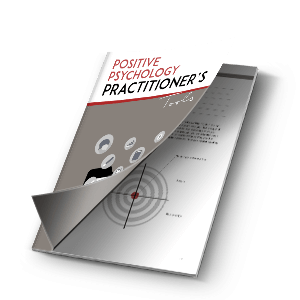 The information contained within aligns with the philosophical framework for facilitator formation. The timing is perfect! This is a very useful article. If we can only be happy with what we are and happy just “to be”…. and give what we are! I am sure violence will diminished and love will have more space to spread it´s wings! Hi! What an excellent text. I´m not psychologist but really in love with mindfulness, positive psychology, resilience and development of well-being. Maybe because I have a long journey ahead due to some difficulties. Thanks! Thank you Mr.Seph for the SELF ACCEPTANCE article and definitely I will apply these survey questions with my students. Hi Cathy, we offer both a theoretical framework as well as a workbook and lots of practical exercises in our upcoming masterclass ‘The Science of Self-Acceptance’. Thank you for this article. I’m wondering how you define “Self Acceptance”. This would be helpful in a definitional mooring for intervention. Please advise. Great article Courtney. I have been doing some professional development workshops on resilience with Vermont employers and your themes tie in well with all the content I am using. I will be presented a half-workshop tomorrow morning and will share some of your info with my participants. Thanks so much!